The talented Amar Chandra Singha, son of the late Babulal Singha of Siliguri, was born in Darjeeling district to a family of traditional musicians. His father and his uncles were all associated with folk music. His father in fact was an Ustad, who would create plays and would travel around singing and performing, mainly Panchali. Amar grew up listening to his father strumming a khamak or dotara and singing quietly to himself, after the family had retired for the night and would often accompany his father on his trips, especially when he was invited to sing kirtans. But his father took great pains to discourage him from entering the world of music. People in the neighbourhood too lost no opportunity to admonish him. His passion for music would serve no purpose they felt. Amar refused to be put off. He learnt Lahankari from Gurudas Singha, who had popularised the genre. Fascinated with the Bhawaiya form from the age of ten, he went on to learn it from Binoy Kumar Singha and later Kameshwar Roy. He has also performed in Panchali folk theatre of the Rajbongshis. Music and singing come easily to Amar. 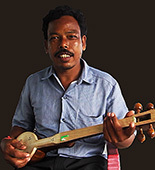 Most of the Panchali songs are embedded in his consciousness almost - since he would hear his father sing different songs all through his childhood. Amar has also composed a few songs himself. As for the dotara, Amar learnt this himself, from merely observing his father. Amar`s enthusiasm and commitment and the recognition he eventually received finally won his father over. The family`s impoverished circumstances did not allow Amar to complete his school education, and he was forced to seek employment in the fields, working for other people. But he continued singing whenever he got an opportunity - with practically no encouragement. Recognition first came his way in 1988 when he was 14 years old - for his Chotka performance at a Bhawaiya competition organised by the district administration. In 1992 he participated in another competition organized by the Raja Sangeet Academy where he came 3rd. In 1993, he received the first prize from yet another government sponsored competition. He has also received the Abbasuddin Smriti Medha Britti award from the Rabindra Bharati University in 2002 and was presented the award by the then governor. Amar is often invited to perform at various university functions and also at prestigious venues. He has performed at various village level functions and has also been invited to perform at Kolkata and for CIIS (Central Institute for Indian Languages) at Mysore, where his music was greatly appreciated. However, he rues the fact that modern cheap compositions are becoming popular at the cost of traditional music. Amar is not a professional musician. He plays and sings out of his love for his music, while eking out a living as a stonemason. Amar teaches his son Rahul who carries on the family`s musical tradition and is currently playing the tabla. Father and son are often invited to play a dotara-tabla duet. Amar also guides a few other children on the dotara. Oddly enough, it is the very people in his locality who scoffed at his passion, who now want to send their children to learn from him. Changed attitudes notwithstanding, Amar is not interested in how many performances he gets. He is content with the appreciation by those who truly understand folk music and continues to remain true to his music.